Bus from KL to Lumut is the most suitable public transportation to reach Lumut due to the lack of other public transportation options like train and flight. For those who are going to Pangkor Island, taking bus from KL to Lumut is the most convenient option because Lumut bus station is just right opposite Lumut Jetty. Upon arrival, passengers can just cross the road to transfer to a ferry to reach Pangkor Island. 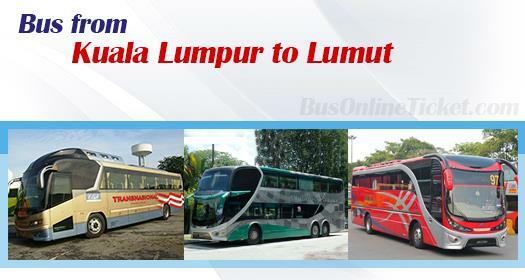 Transnasional and Plusliner are two famous brands offering bus from KL to Lumut. They are highly preferred by customers because of their departure punctuality and quality services. The biggest player for this KL to Lumut route however is Arwana Express, who offers the highest number of daily departures. Arwana is known for specializing in bus services in Perak and Johor. The other two operators are Maju Express and Kesatuan Express. They offer more spacious 3-seat-a-row layout VIP buses to ensure a comfortable journey to passengers. The bus fare is reasonably priced around RM 27.00. The duration required for bus from KL to Lumut takes about 4 hours depending on traffic conditions. Usually, the bus will have 1 stopover for passengers to have a toilet break. The earliest departure time is at 8:00am, while the latest departure time is at 10:50pm. Only Maju Express provides a departure at 2:00am after midnight. All buses going to Lumut depart from TBS (Terminal Bersepadu Selatan). Arwana also provides a departure point at Hentian Duta Bus Terminal, which is another bus terminal in KL. The arrival point in Lumut is at Lumut Bus Station which is just opposite to Lumut Jetty. Therefore, Lumut is considered as the gateway town to Pangkor Island. Many tourists are taking the bus from KL to Lumut before transferring to a ferry to Pangkor Island. Planning for a vacation in Pangkor Island? Now you can book your ticket online with BusOnlineTicket.com now with instant confirmation upon payment. BusOnlineTicket.com accepts credit card and internet banking payments.